Given a platoon of light infantry, take hill 451 and hold it until relieved. Artillery and air support may be called in as required. Performance, conditions, criterion: In our profession as in the military, the last two do not count without the first. 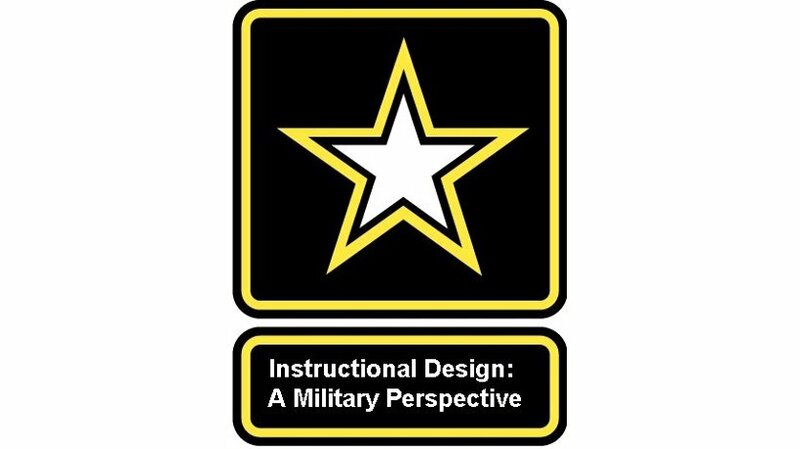 Given a clearly stated a performance problem, the instructional systems technologist will provide a firing solution consisting of a performance-based, criterion referenced objective and the lowest cost, highest efficiency medium to deliver it in 4 hours or less. I use the term “firing solution” deliberately because there is a direct historic military analogy. The Allied bombing campaigns of WWII used what is termed “saturation bombing” strategy. Due to the lack of guidance and aiming tools, hundreds of bombs would be dropped in the hope at least a few would hit the target. In spite of the cost in lives and resources, it was the best they could do and deemed necessary. Today, the military uses precision guided weapons carried or propelled by precisely designed delivery systems to hit the target precisely. Training professionals should too. The performance-based, criterion-referenced objective delivered using the lowest cost, highest efficiency medium is our tool. While teaching behavioral modification via media at the University of North Texas in the 1980’s, I’d already recognized Dr. Robert F. Mager as the key thinker in my profession who delivered the training equivalent of a “unified field theory” in the form of a concise definition of an instructional objective. Every exam I delivered had a 10 point bonus question that required the student to correctly write his definition of an instructional objective with each and every capital and punctuation mark. I said “If you forget everything else from this class but remember and apply that one definition, you will excel.” I’ve been thanked a number of times by my former students for that. They also came away with another aphorism: “Production should be an afterthought.” By that, I meant that the bulk of the effort was in precisely defining the objectives. The rest was straightforward mechanics. Again, much like the well-executed military plan being executed like clockwork with everyone involved doing the right thing at the right time in the right order. As training professionals, we exist for exactly one goal: competency. But, you ask, what is “competency"? In those two phrases I deliver to you my entire professional experience in compiled form. Having done so, I wish to now provide you with an example of precision targeting as well as a refresher on well-formed objectives. The target audience is you, the training professional. The objective is to set a competency level for your ability to recognize and analyze objectives. “Competency” is defined as your achieving a score of at least 90% on the post test. As to the delivery medium, it’s designed to work in the most constrained bandwidth situation. While I am no big fan of Flash due to its limitations and requirement for a constantly updated plug-in, I chose it for this exercise because of its ubiquitous nature, small footprint, ability to run in limited bandwidth, and the very simple nature of the code in this tutorial. Now, as Mao once said “Let a hundred flowers bloom, let a hundred schools of thought contend.” Push back all you want! Dialectic is the heart of self-improvement and I am always ready to learn. If you refer to the presentation, please reference the page number in the lower left of the screen. I look forward to hearing from you. Click on the link to evaluate and expand your knowledge of instructional objectives. Author Byline: David A. Mallette, Instructional Systems TechnologistDave currently manages the E-Learning Group at Helmerich & Payne Int’l Drilling Company, the largest domestic drilling company in the United States. The link above will provide more information.